A rare opportunity to purchase 2 Popeye’s stores in upstate NY. The stores were recently built and both have long term leases and franchise terms in place. Both stores have a Drive-Thru and are not 24 hour stores. Combined Rent as a percentage of sales is ONLY 4.3% which is unheard of in the QSR world. Both stores operate 100% Absentee. A more hands-on owner operator could increase sales, reduce labor costs and increase profits. This is a tremendous opportunity to join the brand. Popeye’s has been ranked number 27 of the top 100 restaurants in 2015 by Nations Restaurants News. If you are looking to join a well-known respected QSR system with over 2,000 locations and system-wide sales of $2.4 Billion, then this store might be for you. To be approved by Popeye’s the buyer must have experience operating multi-unit fast food franchise brands or something similar. The Popeyes® brand was founded in New Orleans, Louisiana in 1972 and is the world's second largest quick-service chicken concept (based on the number of units). 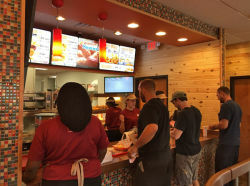 Within the QSR industry, Popeyes distinguishes itself with a unique "New Orleans" style menu that features spicy chicken, chicken tenders, fried shrimp and other seafood, as well as jambalaya, Red Beans and Rice and other regional items. Popeyes is a highly differentiated QSR brand with a passion for its Louisiana heritage and flavorful authentic food. Popeyes® serves food the world craves and is continuing to expand its global reach. The Company operates and franchises over 2,000 Popeyes restaurants worldwide. Of the 1,600 domestic franchised restaurants, approximately 70% are concentrated in Texas, California, Louisiana, Florida, Illinois, Maryland, New York, Georgia, Virginia and Mississippi. Of the nearly 400 international franchised restaurants, approximately 55% are located in Korea, Canada and Turkey. More than 90% of the company-operated restaurants are concentrated in Louisiana and Tennessee. At Popeyes®, the Leadership Team is on a mission to increase franchisee success in every facet of the business. Profitability and service excellence are achieved with a focus on five strategic pillars that guide every business decision. To find out more about this Popeyes franchise, please fill out the form below and submit. New York - $0 SOLD!